The paperback edition of the book is 128 pages long and measures up at roughly 12×9 inches, which really helps to show off the 1000+ high res images from around the set and exotic research trips. Make sure you finish Uncharted 3 before you read the book, as there are a few spoilers. The frequent blocks of text explain about all the different roles of the Naughty Dog development team in a way that doesn’t baffle with impenetrable tech jargon. It’s a great way to gain a new perspective on the industry from an insider and also someone that clearly loves his job and has a tremendous amount of respect for the people around him. North’s easy going nature flows well here and easily transfers into his writing style especially when he’s retelling funny anecdotes from the days of motion-capture shooting. There are around 50 QR codes to scan with your smartphone to see exclusive videos. 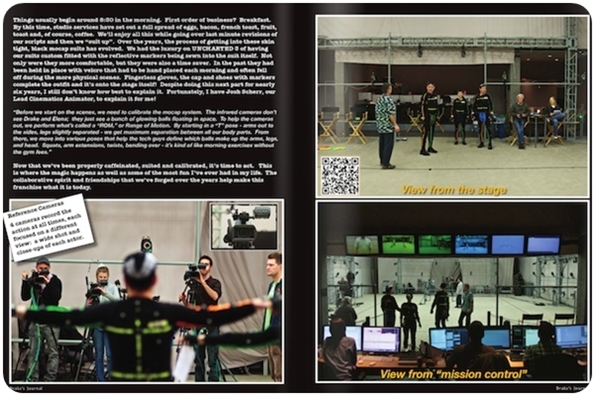 If you opt for a digital version of the book, you can click the code to go direct to the video. Which you’ll find much less frustrating if you have an older phone with a crappy camera and slow browsing capabilities. The videos really help to emphasise a point, or they might just be funny. 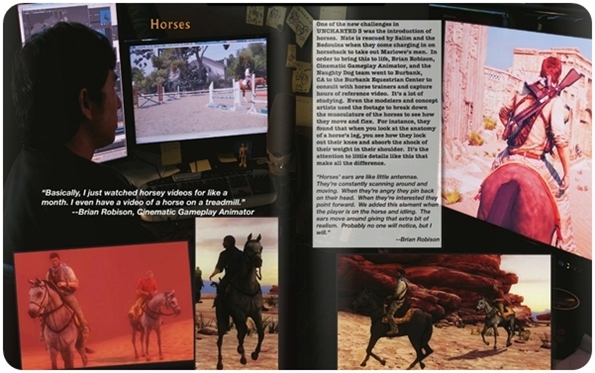 Seeing Nolan perform the mo-cap for the horse riding is something you’ll never forget, for all the wrong reasons. The sound will probably haunt you for a while too. Fans will surely enjoy the extra on-set details revealed in the book, such as discovering that Charlie Cutter breaking his leg was only scripted in late on to accommodate the actor (Graham McTavish) having to rush off to start filming The Hobbit, as he was originally planned to be in whole game. Actress Emily Rose reveals some interesting facts about a future Elena almost faced too. Don’t be expecting a Nolan North biography -although we imagine that would be well worth a read- this is all about the creation of the game from his perspective and the interesting interviews he gets from the team. Having worked with many of them for years, you can see that you’re getting information in a much more relaxed fashion than you would in a typical press interview. Fans of Uncharted, or gaming in general should snap this up for an intriguing, detailed look into one of this generation’s trailblazing studios from the hardest working voice actor out there. Hell, a few developers should probably pick it up too if they want to stand a chance on closing the gap. 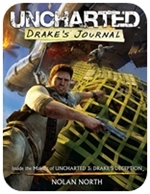 Head over to the official site of Uncharted: Drake’s Journal for purchasing details.